No Ovens – In the USA, I had perfected the art of oven cooking. It was easy! I got off work, stopped by the grocery store, and I got all of the things that I needed. I then headed home and spent maybe 20 minutes or less, prepping everything. Once everything was prepped, I put it in a casserole dish and popped it in the oven. Less than 1 hour later, everything would be done! It is possible to buy an oven here, whether it is one like back home or a conventional oven, but then you have to just find the space for it! Expensive and Seasonal Fruits and Veggies – In the USA, you have access to most fruits and veggies wherever and whenever you want. I don’t know if that is a good thing or a bad thing, since you wonder how everything can always be in season..but.. it is convenient! In Korea, things are really just seasonal. The good thing about this is that the fruits and vegetables taste wonderful!! I have never had strawberries so sweet or tomatoes so ripe, but it comes at a price! 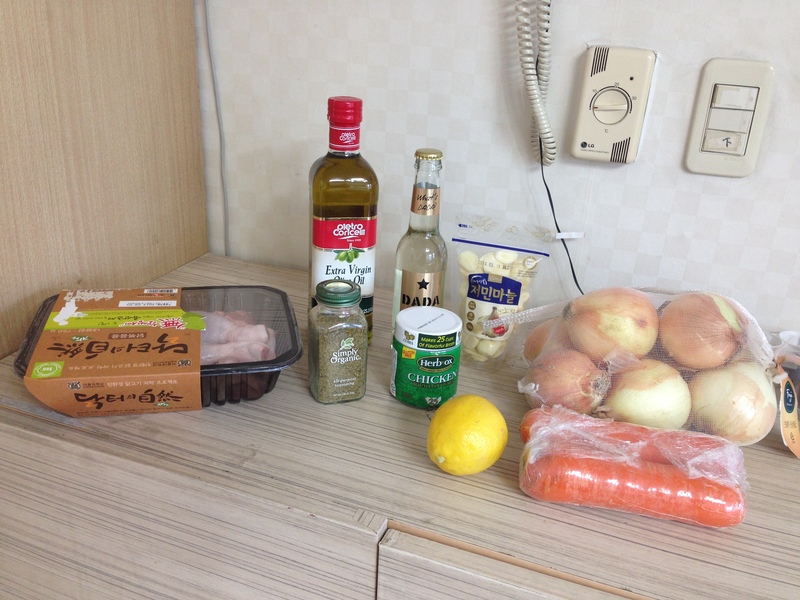 Hard-to-Find Ingredients – Being in a foreign country, you will see it is hard to find many ingredients. People here have their own cuisines, that they are used to cooking, so the supermarkets are catered to that. It’s possible to find everything, but it’s like an easter egg hunt. Time – Working the night schedule, the last thing you want to do is get off work at 10 pm and then worry about what to eat for dinner. 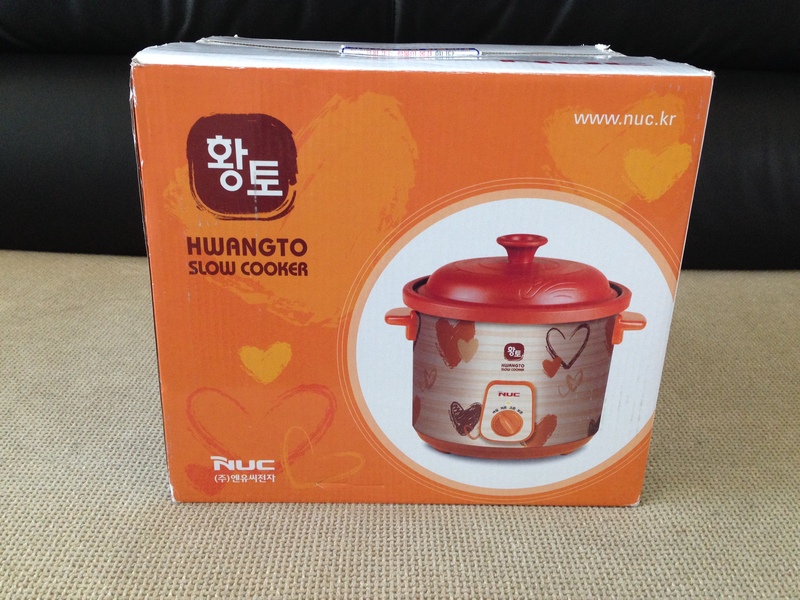 Using a slow cooker is the perfect answer to most of the problems above! It’s easy, convenient, small and functional. I went to E-Mart a few weeks ago and bought one. It has been great so far! 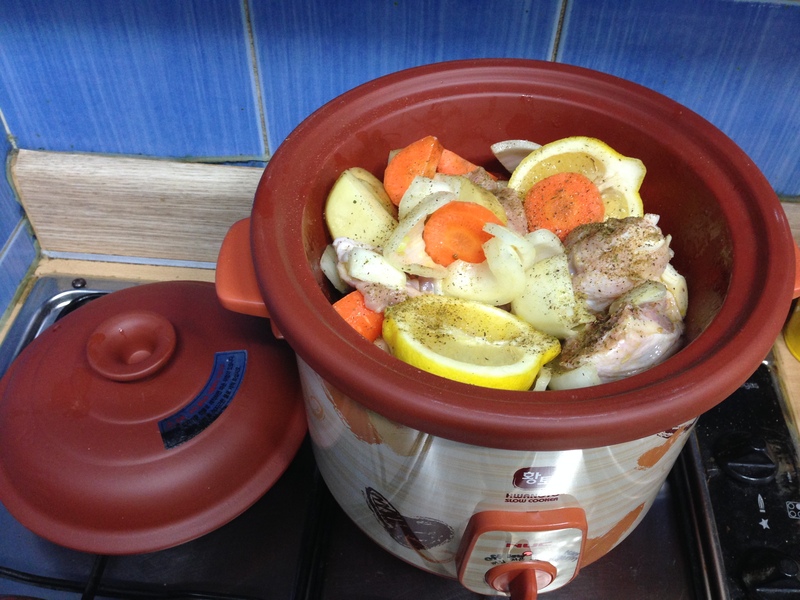 I have decided to dedicate a section of my blog, to list all my slow cooker recipes. This section is going to be called “Cooking in Korea” and can be found in the menu bar. 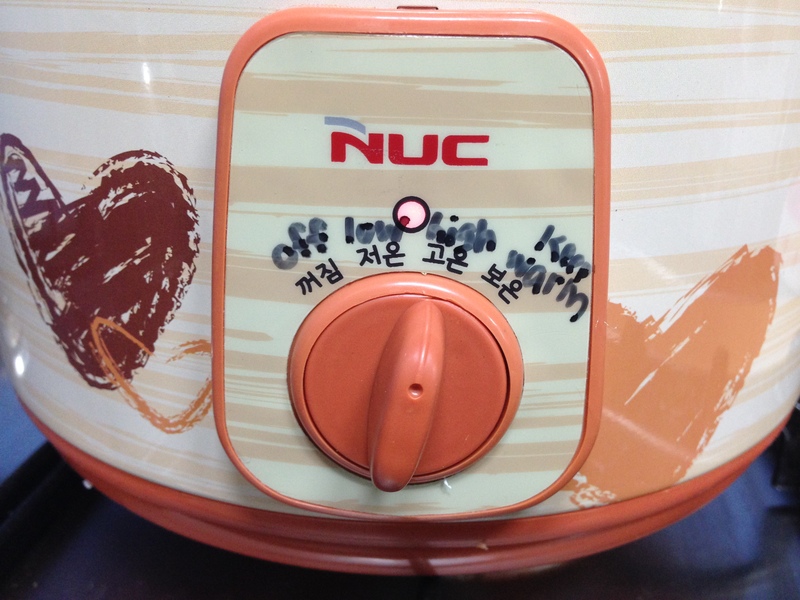 The recipes will all be adapted, so that all the items will be easy (or at least easier) to find in Korea! So here below was my first recipe with my slow cooker and it came out delicious! We made pesto pasta to go with it and it was definitely exciting to come home to! 1 large carrot, chopped and peeled. Rinse the chicken and put into the slow cooker. 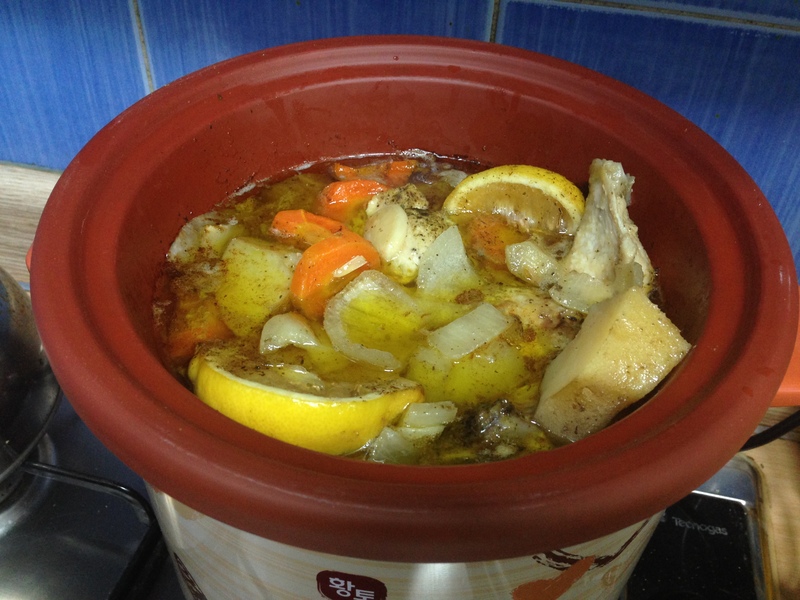 Place the potato wedges, carrots, and the onions with the chicken, inside the slow cooker. Put in the garlic cloves. Next, pour in the wine and olive oil. If needed, feel free to add more or less. Add the water and then put in the bullion cubes (they will dissolve over time). Squeeze the juice of half of the lemon over the chicken (strain out seeds); sprinkle with oregano. Season chicken with salt and black pepper. Place the other half of the lemon in the slow cooker. Cover, and cook on Low setting for 8-10 hours, or on High setting 4-6 hours. Afterwards, just keep on warm until you pack the food away. What everything should roughly look like before you close the lid for 8 hrs. What everything looks like after! 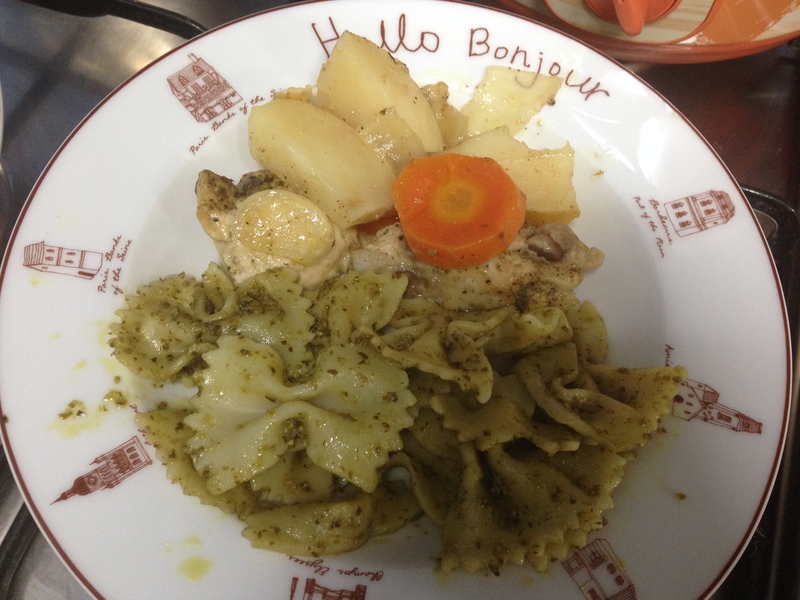 On the plate with the pesto pasta!